The high back, Bistro style counter stool will give your dining room or bar decor a cool retro-vintage feel. This stylish metal stool features a curved back with a vertical slat and a cross brace under the seat for added support and stability. A drain hole in the center of the seat allows water to drain, preventing rust. The lower support brace doubles as a footrest, and plastic floor glides protect your floor by sliding smoothly when moving it. Galvanized steel construction and a powder coat finish ensure durability and easy maintenance. Designed for both commercial and residential use, this trend-setting counter stool is a great choice for your restaurant's outdoor dining area or your home bar. 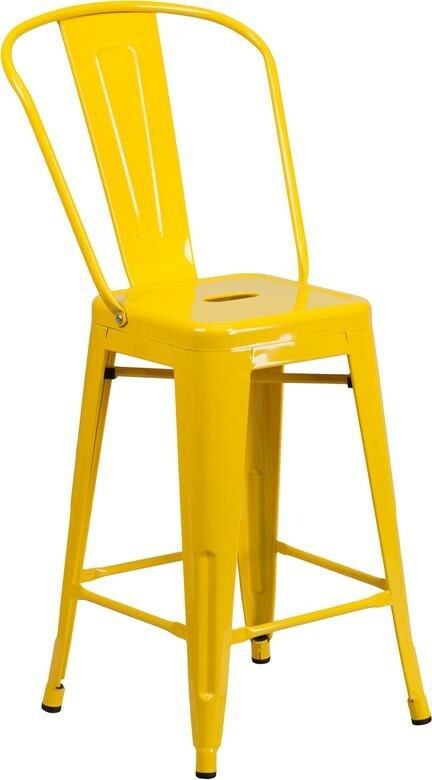 The Metal Indoor-Outdoor Chairs 24'' High Yellow Metal Indoor-Outdoor Counter Height Stool with Back by Winslow Home at Sam Levitz Furniture in the Tucson, Oro Valley, Marana, Vail, and Green Valley, AZ area. Product availability may vary. Contact us for the most current availability on this product.